Cling Cloth Beeswax Food Wraps - We've Launched! We’ve done it – Cling Cloth has now been launched! After months of trial and error, and error and trial, and seemingly never ending trials. Getting the perfect formula and ratios of ingredients down. Working out the production process. Testing, testing, testing. Searching high and low for the best, most ethical and most local sources for our beeswax, resin and jojoba oil. Researching the sustainability factors involved in cloth production and source materials (we considered finding a hemp/hemp blend, but after the research came down in favour of organic cotton). More research and sourcing for packaging options (this, by the way, was the HARDEST part of the whole development process!). We did finally manage to develop packaging using 100% recycled paper, small enough to fit in a large letter shipping envelope, and printed in the UK. Developing packaging that was eco-friendly, functional, will minimal waste was actually the hardest part of the whole development process. And of course there was the website build, design, eCommerce integrations, marketing channel integrations, shipping integrations, social media integrations (but that was the easy part since I’ve done it all before). Photos, photos, and more photos taken. And we’ve launched! Well, it was just a soft-local launch to make sure we had all the details, bugs and process worked out. That way I could easily send flowers and give hugs to anyone who’s order may have gotten messed up. But hopefully that hasn’t happened. After a small post on a local facebook group, orders came flooding in and the operation was put to the test. Heads were spinning trying to ensure all the details were taken care of, boxes ticked and care given. Now a large Royal Mail bag full of packages has been dropped off and they will be dispatched promptly! We are on a mission to help people reduce their consumption of single-use plastics, and we just took a major step in that direction! We believe beeswax food wraps should be used by everyone, and Cling Cloth offers a local, stylish, and well-priced option to the UK and Ireland. Thank you all who were early purchasers and who are making good decisions for our planet! You’ve helped us get launched, and we are grateful. If I like this product as much as I hope that I am going to, I would like to be able to send a ‘gift’ purchase to friends to try, perhaps just one medium sized wrap with information about the product and a discount of future purchases. I think that this would be a great way to promote your product. Thanks for your comment! We are constantly considering whether we should sell the wraps individually. We appreciate your feedback. Lots to come before Christmas – we think they would make fantastic stocking stuffers! Hi, I am very interested in this product and have been dreaming of something like this! Why do you suggest not using it for Raw meat – for fear of cross contamination? How about if one were to only use a certain colour for meat / fish. Would it be ok with cooked meat such as ham? Thank you for your question! It is really just a case of better safe than sorry, since you should only cleanse the Cling Cloth gently in order to maintain its wax barrier. We do use it with cooked meats, however, when stored in the fridge. We are developing a line of different designs with various categories of foods so you can tell what may be under your Cling Cloth and keep them sorted for various uses! Stay tuned! Hi, just stumbled on your site. Sounds an excellent idea! Whilst I respect your choice of organic cotton for the cloths, I wonder if an additional future option could be to source fabric remnants. 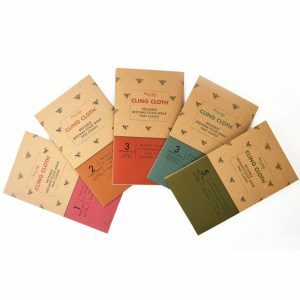 Or even, if it proves practical to do so, to create a “kit” for people to wax their own cotton remnants? My sister has been overseas over Christmas so I didn’t get her a present yet – might have found a good one here! Thanks. We love the idea of using remnants and using up what already exists. The biggest issue is that if it is not 100% cotton (poly blends) then it is not really compostable. Poly blends – polyester – is actually plastic! So not always knowing the origin or source would be problematic. We also want our product to look beautiful and appeal to everyone – so it becomes common to find ways to replace plastic use in kitchens. We want more than eco-warriors to make these changes! So we are designing beautiful fabrics, so since we are starting from scratch, we are choosing organic cotton. We’ve actually researched many fabric options (including bamboo and hemp) and the environmental impact they have via the production of the raw materials, but also the processing. Things like bamboo are better in the growing process, but use a lot of chemicals in processing. We wish there were easier answers to these questions, we had a tough time deciding the best approach! Kits are great ideas. These can be made at home for DIY lovers. It is a bit messy and you need the right ingredients, but it is do-able!